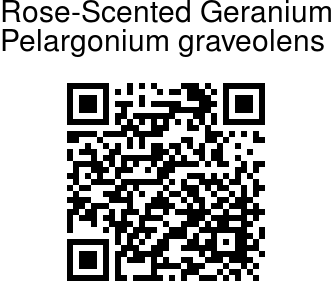 Rose-Scented Geranium is an erect, much-branched shrub, that can reach a height of up to 1.3 m and a spread of 1 m. The hairy stems are herbaceous when young, becoming woody with age. The deeply incised leaves are velvety and soft to the touch due to the presence of numerous glandular hairs. The leaves are strongly rose-scented. The showy white to pinkish flowers are borne in an umbel-like inflorescence and are present from late winter to summer peaking in spring. 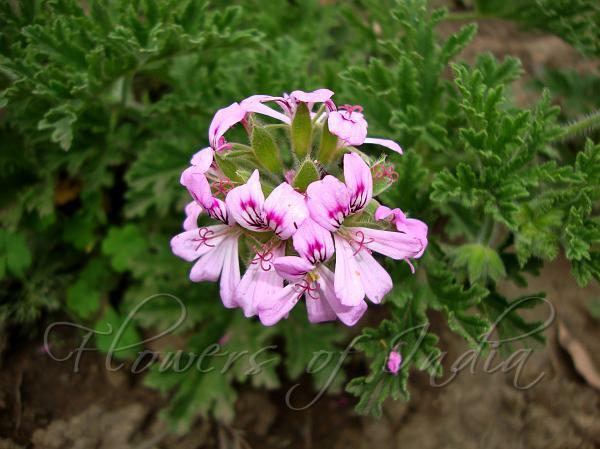 Rose-Scented Geranium is used in the production of geranium oil, which is used as a substitute for the expensive attar of roses in the perfume trade. Cultivars and hybrids of this species are grown commercially.